Tonight I thought I would dress up a bit and take some pics. 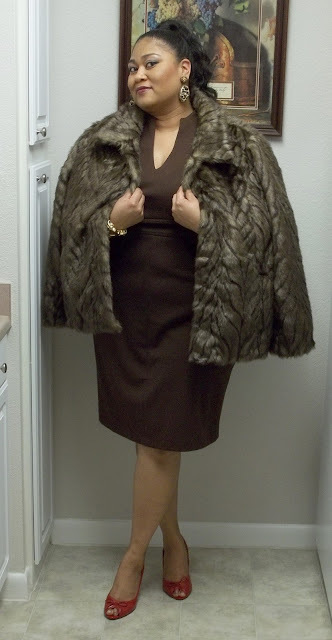 I got this dress at Dillard's on clearance last year and have never worn it (Adrianna Papell), the faux fur coat is from ASOS and the red pumps are Antonio Melani (Dillard's). The fab cheetah earrings are vintage from my mother-in-law. I am having issues with my camera so I apologize for the clarity of the photos tonight. Tell me what you think by leaving a comment. Thanks! LOVE! One of my faves! I mean't that jacket I need it and a purse.